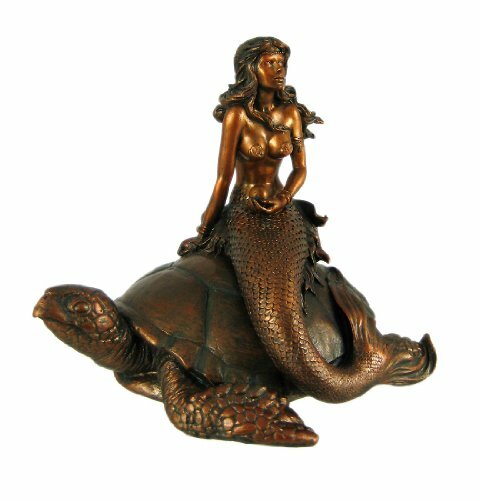 This is a Top Collection figurine of a mermaid riding on top of a big sea turtle. Measuring at 6 inches tall, this magical figurine displays exquisite craftsmanship. It is made of made of designer resin with hand-painted patina for a high-quality bronze finish. This process gives the product a high-quality antique look without sacrificing the details. The product is sturdy and fits nicely with any decor at home or in the office. A great addition to any mermaid or sea-life collection. Packed with molded Styrofoam in its own beautiful gift-box, it is ready as a present for any occasion and ideal for mermaid or sea-life enthusiasts. EXQUISITE CRAFTSMANSHIP - Cast resin and hand-painted in bronze-colored finish - creates high-quality look with intricate details. COLLECTIBLE - Measures 6 inches tall. Sturdy and fits nicely with any decor at home or in the office. Great addition to any mermaid or sea-life collection. PERFECT PRESENT - Packed with molded Styrofoam in beautiful gift-box ready for any occasion. Ideal present for mermaid or sea-life enthusiasts. If you have any questions about this product by Top Collection, contact us by completing and submitting the form below. If you are looking for a specif part number, please include it with your message.